1961: Albert Grootscholten starts in Poeldijk with 1.100 windows of flat glass, 4 grape glasshouses. 2.500 m2 open field and oil-boiler. 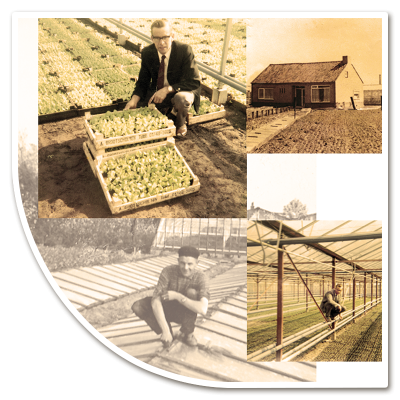 1964: Nursery Grootscholten becomes young-plant nursery Grootscholten. Albert has a talent for growing young plant-material and specializes himself. 1974: The establishment of Globe Plant Group, a cooperation with nurseries in the region. 1976: a new construction on a larger location, Honselerdijk. 1985: Johan, Alberts oldest son, joins the company. 1992: Vera, Alberts daughter, joins the company. The export to Belgium, Germany and Switzerland is up coming. 1997: Paul, Alberts youngest son, joins the company. 1999: Start new construction on a larger location, Vierpolders. 36.000 m2 wide-span greenhouse. With modern technics for optimal growing conditions and the highest environment demands. 2000 – 2015: Various expansions with modern constructions lead to 53.000 m2. 2004: Purchase of a selection-machine, that leads to homogeneous quantities. 2007: Purchase of a seeding-machine. 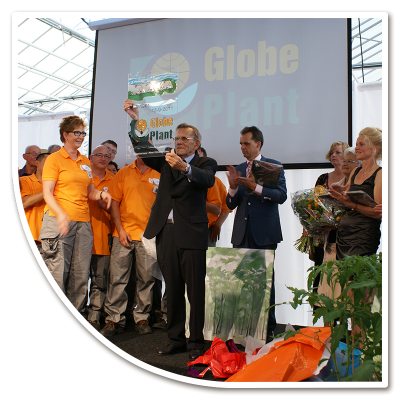 2011: Plant-nursery Grootscholten becomes Globe Plant. Celebration of our 50th anniversary. 2016: Geothermal energy in use. Medio 2016 we started growing young plants for cut flowers. 2017: Purchase of new machinery for the cut flower section. A climate-cel in use for optimal growth start.